For the software company acquired by BMC Software, see Tideway Systems. The Tideway is the part of the River Thames in England that is subject to tides. This stretch of water is downstream from Teddington Lock and in its widest definition is just under 160 kilometres (99 mi) long. The Tideway includes the Thames Estuary, the Thames Gateway and the Pool of London. Depending on the time of year, the river tide rises and falls twice a day by up to 7 m (24 ft) and, due to the need to overcome the outflow of fresh water from the Thames Basin, it takes longer to subside (6–9 hours) than it does to flow in (4–5 hours). London Bridge is used as the basis for published tide tables giving the times of high tide. High tide reaches Putney about 30 minutes later. Low-lying banks of London have been defended against natural vulnerability to flooding by storm surges. The threat has increased due to a slow but continuous rise in high water level, caused by the extremely slow 'tilting' of Britain (up in the north and down in the south) due to post-glacial rebound and the gradual rise in sea levels due to climate change. The Thames Barrier was constructed across the Thames at Woolwich to deal with this threat. The Tideway is managed by the Port of London Authority (PLA) and is often referred to as the Port of London. The upstream limit of its authority is marked by an obelisk just short of Teddington Lock. The PLA is responsible for one lock on the Thames: Richmond Lock. 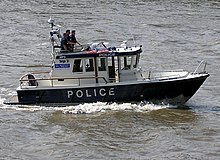 In London, the Thames is policed by the Thames Division, the river police arm of London’s Metropolitan Police. Essex Police and Kent Police have responsibilities for the rest of the Tideway. 21st century criminal investigations have included the Roberto Calvi and Torso in the Thames cases. The London Fire Brigade has a fire boat on the river. As a result of the Marchioness disaster in 1989 when 51 people died, the Government asked the Maritime and Coastguard Agency, the Port of London Authority and the Royal National Lifeboat Institution (RNLI) to work together to set up a dedicated Search and Rescue service for the tidal River Thames. As a result, there are four lifeboat stations on the Thames, at: Teddington, Chiswick Pier, Tower Pier and Gravesend. 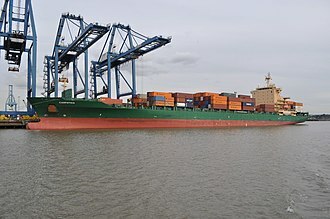 The river is navigable to large ocean-going ships as far as the Pool of London at London Bridge and is the United Kingdom's second largest port by tonnage. Today, little commercial traffic passes above the Thames Barrier, and central London sees only the occasional visiting cruise ship or warship moored alongside HMS Belfast, and a few smaller aggregate or refuse vessels, operating from wharves in the west of London. Most trade is handled by the Port of Tilbury, ro-ro ferry terminals at Dagenham and Dartford, and petroleum products handling facilities at Purfleet, Coryton and Canvey Island. There is a speed limit of 8 knots (15 km/h) west of Wandsworth Bridge and in tributary creeks, and except for authorised vehicles, 12 knots (22 km/h) between Wandsworth Bridge and Margaretness. The tidal river is used for leisure navigation. 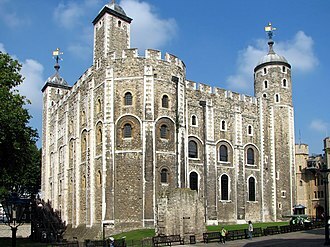 In London sections there are many sightseeing tours in tourist boats past riverside attractions such as the Houses of Parliament and the Tower of London, as well as regular riverboat services provided by London River Services. This section is not suitable for sporting activity because of the strong stream through the bridges. Rowing has a significant presence upstream of Putney Bridge, while sailing takes place in the same area and also along the coasts of the Estuary. The annual Great River Race for traditional rowed craft takes place over the stretch from Greenwich to Ham. 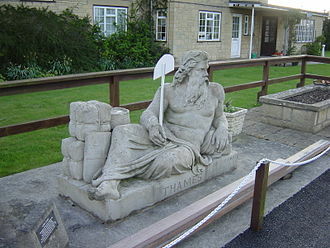 Thames meander challenges along the length of the Thames from Lechlade often pass through the London sections and finish well downstream, for example at Gravesend Pier. The Grand Union Canal joins the river at Brentford, with a branch – the Regent's Canal – joining at Limehouse Basin. The other part of the canal network still connecting on the Tideway is the River Lea Navigation. Narrow low-lying belts beside the tidal section of the Thames regularly flood at spring tides, supporting brackish plants. One such example is at Chiswick Lane South, where the river, as pictured, overflows this road a few times per year. (Picture taken in 2006). Although water quality has improved over the last 40 years and efforts to clean up the Tideway have led to the reintroduction of marine life and birds, the environment of the Tideway is still poor. Heavier rainfall in London causes overflows from pipes on the river banks from the standard type of sewer in the capital, the combined sewer. Around 39,000,000 m3 (3.9×1010 l) or 39 million tonnes of untreated sewage mixed with rainwater are released into the Tideway each year from sewage treatment works and combined sewer overflows (CSOs), averaging 106,849 m3 (106,849,000 l) per day or 106,849 tonnes per day. These CSOs can cause the deaths of marine life and health hazards for river users. The Thames Tideway Scheme, under construction, aims to divert most of the overflow from sewers into a tunnel under the river. The Thames Estuary is bordered by the coast and the low-lying lands upstream between the mouth of the River Stour on the Essex/Suffolk border and The Swale in north Kent. It is now usually designated the Greater Thames Estuary and is one of the largest inlets on the coast of Great Britain. 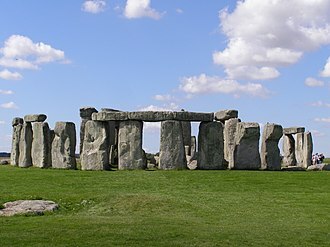 The water can rise by 4 metres moving at a speed of 8 miles per hour. The estuary extends into London near Tower Bridge, and can be divided into the Outer Estuary up to the Swale at the west end of the Isle of Sheppey, and the Inner Estuary, designated the Thames Gateway above this point. The shore of the Outer Estuary consists of saltmarshes and mudflats, but there are man-made embankments along much of the route. 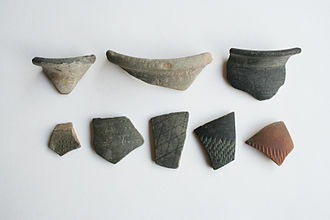 Behind these, the land is cultivated or used for grazing. Parts of the Outer Estuary are on a major shipping route. The Gateway is some 70 kilometres (43 mi) long, stretching from the Isle of Sheppey to Westferry in Tower Hamlets. Its boundary was drawn to capture the riverside strip that formerly hosted many land extensive industries, serving London and the South East. The decline of these industries has left a legacy of large scale dereliction and contaminated land, but an opportunity for major redevelopment. The area includes the London Docklands, Millennium Dome, London Riverside and Thames Barrier. 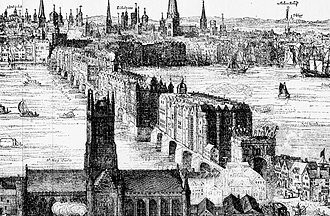 The Pool of London is divided into two parts, the Lower Pool and Upper Pool. The Lower Pool traditionally runs from the Cherry Garden Pier in Rotherhithe to Tower Bridge. The Upper Pool consists of the section between Tower Bridge and London Bridge. In the 18th and 19th centuries the river was lined with nearly continuous walls of wharves running for miles along both banks, and hundreds of ships moored in the river or alongside the quays. The lack of capacity in the Pool of London prompted landowners to build London's Docklands with enclosed docks with better security and facilities. The abrupt collapse of commercial traffic in the Thames due to the introduction of shipping containers and coastal deep-water ports in the 1960s emptied the Pool and led to all of the wharves being closed down. The Lower Pool area was extensively redeveloped in the 1980s and 1990s to create new residential and commercial neighbourhoods, often using converted warehouses. In the Upper Pool this provided scope for office development in the City of London and Southwark. Battersea Power Station viewed from the north bank of the River Thames at Pimlico. Between London Bridge and Putney Bridge, the river passes through Central London and some of the most famous landmarks. River boats carry tourists up down and across the river, and also provide a regular commuter service. View from Richmond Hill, Richmond. From Putney Bridge to Teddington Lock, the river passes through inner and outer suburbs such as Hammersmith, Chiswick, Barnes, Richmond on Thames and Ham. This part of the Tideway is home to most of London's rowing clubs, and is the venue for training and racing throughout the year. The Championship Course over which The Boat Race and many other events are run, stretches from Putney to Mortlake. ^ "GOV.UK". Environment Agency. Retrieved 2014-04-17. ^ "ENGLAND | Thames lifeboat service launched". BBC News. 2002-01-02. Retrieved 2014-04-17. The Mirror of the Sea, Joseph Conrad at Wikiquote. From the estuary to the Port of London by boat in 1906, when the port was the commercial heart of the British Empire. London's River – An intriguing journey down the Thames in rare archive film. River Thames Boat Blog – A blog with articles dedicated to helping people get the most from boating on the Tidal River Thames in London. Fantasy flight along the Thames in a high-speed pod from the London Eye! Dagenham is a large suburb of east London, England. In the London Borough of Barking and Dagenham, it is 11.5 miles east of Charing Cross and 9.5 miles east of the City of London. Historically in Essex, it was a village and remained mostly undeveloped until 1921. The population of the significantly increased in the 20th century, with the parish of Dagenham becoming an urban district in 1926. It has formed part of Greater London since 1965 and is a residential area, with some areas of declining industrial activity. The southern part of Dagenham, adjacent to the River Thames, Dagenham first appeared in a document in a charter of Barking Abbey dating from 666 AD. The name almost certainly originated with a farmstead, the ham or farm of a man called Daecca. In 1931 the Ford Motor Company relocated from Trafford Park in Manchester, to a plant in Dagenham, by the 1950s Ford had taken over Briggs at Dagenham and its other sites at Doncaster, Southampton and Romford. At its peak the Dagenham plant had 4 million square feet of floor space, in 2005 Cummins went into a joint venture and offered $15 million to reinstate the factory. Ford and Cummins offered a good redundancy package, billed as one of the best in UK manufacturing and it is the location of the Dagenham wind turbines. Some 4,000 people now work at the Ford plant, the movie Made in Dagenham is a dramatisation of the 1968 Ford sewing machinists strike at the plant, when female workers walked out in protest against sexual discrimination and unequal pay. Sterling Ltd who were famous for manufacturing British Army weapons and Jaguar car parts were based in Dagenham until they went bankrupt in 1988. The May & Baker plant and run by Sanofi-Aventis, occupies a 108-acre site in Rainham Road South and it was abandoned in 2013 when the company closed this plant. The council has decided how to use the vacant site and they will redevelop it with a new shopping centre, stores announced so far are a Sainsburys supermarket and a pub restaurant. More stores will be announced in the future, Dagenham was an ancient, and civil, parish in the Becontree hundred of Essex. The Metropolitan Police District was extended in 1840 to include Dagenham, the parish formed part of the Romford Rural District from 1894. A naval ship is a military ship used by a navy. 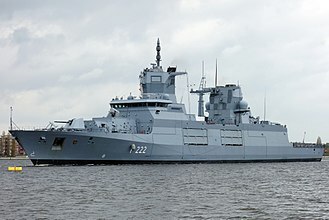 Naval ships are differentiated from civilian ships by construction and purpose, naval ships are damage resilient and armed with weapon systems, though armament on troop transports is light or non-existent. 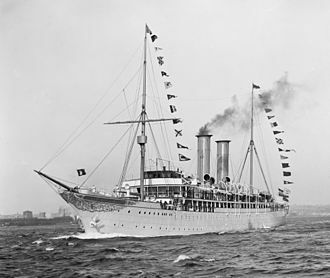 Naval ships designed primarily for naval warfare are termed warships, as opposed to support or shipyard operations, submarine – self-propelled submersible types regardless of whether they are employed as combatant, auxiliary, or research and development vehicles which have at least a residual combat capability. Amphibious warfare – ships having organic capability for amphibious assault and which have characteristics enabling long duration operations on the high seas, combat logistics – ships that have the capability to provide underway replenishment to fleet units. Mine warfare – ships whose primary function is mine warfare on the high seas, coastal defense – ships whose primary function is coastal patrol and interdiction. Sealift – ships that have the capability to provide material support to other deployed units operating far from home base. 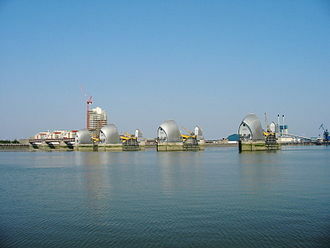 The Thames Barrier is a movable flood barrier in the River Thames east of Central London. When needed, it is closed during high tide, at low tide it can be opened to restore the flow towards the sea. 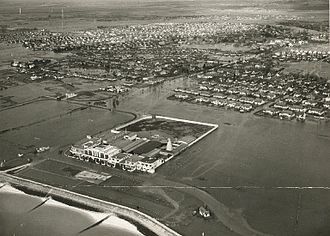 The report of Sir Hermann Bondi on the North Sea flood of 1953 affecting parts of the Thames Estuary, London is vulnerable to flooding and from heavy tides closing in. A storm surge generated by low pressure in the Atlantic Ocean sometimes tracks eastwards past the north of Scotland, the surge tide is funnelled down the North Sea which narrows towards the English Channel and the Thames Estuary. If the storm surge coincides with a tide, dangerously high water levels can occur in the Thames Estuary. The threat has increased over time due to the slow but continuous rise in water levels over the centuries. In the 1928 Thames flood,14 people died, after 300 people died in the UK in the North Sea flood of 1953, the issue gained new prominence. Early proposals for a control system were stymied by the need for a large opening in the barrier to allow for vessels from the London docks to pass through. The concept of the gates was devised by Charles Draper. In 1969, from his parents house in Pellatt Grove, Wood Green, the novel rotating cylinders were based on the design of the taps on his gas cooker. The barrier was designed by Rendel and Tritton for the Greater London Council and tested at the Hydraulics Research Station, Wallingford. The site at New Charlton was chosen because of the straightness of the banks. Work began at the site in 1974 and construction, which had been undertaken by a Costain/Hollandsche Beton Maatschappij/Tarmac Construction consortium, was largely complete by 1982. The gates of the barrier were made by Cleveland Bridge UK Ltd at Dents Wharf on the River Tees, in addition to the barrier, the flood defences for 11 miles down river were raised and strengthened. The barrier was officially opened on 8 May 1984 by Queen Elizabeth II, total construction cost was around £534 million with an additional £100 million for river defences. Built across a 520-metre wide stretch of the river, the barrier divides the river into four 61-metre, there are four smaller non-navigable channels between nine concrete piers and two abutments. A wharf, staith or staithe is a structure on the shore of a harbor or on the bank of a river or canal where ships may dock to load and unload cargo or passengers. Such a structure includes one or more berths, and may include piers, warehouses, a wharf commonly comprises a fixed platform, often on pilings. 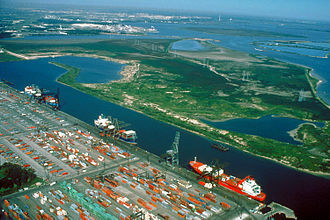 Commercial ports may have warehouses that serve as storage areas. A pier, raised over the rather than within it, is commonly used for cases where the weight or volume of cargos will be low. Smaller and more modern wharves are sometimes built on devices to keep them at the same level as the ship. In some contexts wharf and quay may be used to mean pier, berth, in old ports such as London many old wharves have been converted to residential or office use. Certain early railways in England referred to goods loading points as wharves, the term was carried over from marine usage. The person who was resident in charge of the wharf was referred to as a wharfinger. The word wharf comes from the Old English hwearf, meaning bank or shore, wharfage refers to a fee charged by ports for the cargo handled there. 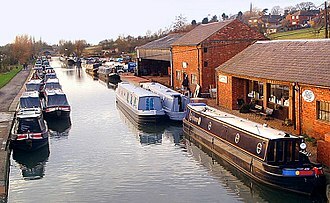 Originally, werf or werva in Old Dutch simply referred to inhabited ground that was not yet built on and this could explain the name Ministry Wharf located at Saunderton, just outside High Wycombe, which is nowhere near any body of water. In support of this explanation is the fact that places in England with wharf in their names are in areas with a high Dutch influence. In the northeast and east of England the term staith or staithe is used, both originally referred to staithes in the sense of jetties or wharves. However, the term staith may be used to only to loading chutes or ramps used for bulk commodities like coal in loading ships. Quay, on the hand, has its origin in the Proto-Celtic language. Before it changed to its current form under influence of the modern French quai, its Middle English spelling was key and this in turn came from the Old North French cai, both roughly meaning sand bank. The Old French term came from Gaulish caium, ultimately tracing back to the Proto-Celtic *kagio- to encompass, modern cognates include Welsh cae fence and Cornish ke hedge. Woolwich is a town in the Royal Borough of Greenwich, south east London, England. 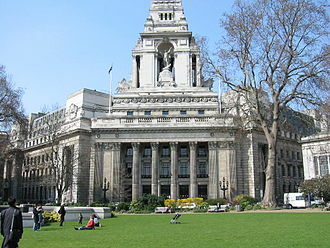 Originally in Kent, it has been part of the London metropolitan area since the 19th century, in 1965, most of the former Metropolitan Borough of Woolwich became part of Greenwich Borough, of which it remains the administrative centre. Throughout the 17th, 18th, 19th and most of the 20th century, Woolwich was an important military and it is a river crossing point, with the Woolwich Ferry and the Woolwich foot tunnel crossing to North Woolwich. Woolwich is identified in the London Plan as an opportunity area as well as a centre in Greater London. Woolwich has been inhabited since at least the Iron Age, a path connected the riverside settlement with Watling Street, perhaps of Iron Age origin. Sandy Hill Road may be a remnant of this early path and it is generally believed that the name Woolwich derives from an Anglo-Saxon word meaning trading place for wool. 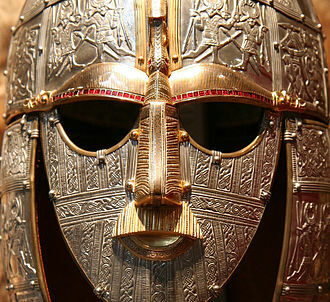 It is not clear whether Woolwich was a proper -wich town, however, in 2015 Oxford Archaeology discovered a Saxon burial site near the riverside with 76 skeletons from the late 7th or early 8th century. The absence of grave deposits indicates that this was an early Christian settlement, the first church, which stood to the north of the present parish church, was almost certainly pre-Norman and dedicated to Saint Lawrence. It was probably rebuilt in stone around 1100, from the 10th till the mid-12th century Woolwich was controlled by the abbots of St. Peters Abbey in Ghent. As a result of this tenure Woolwich is not mentioned in the Domesday Book, it is thought that the 63 acres listed as Hulviz refer to North Woolwich, medieval Woolwich was susceptible to flooding. In 1236 many were killed by a flood, Woolwich Ferry was first mentioned in 1308 but may be much older. Around Bell Water Gate some private shipbuilding or repair may have existed in the 15th century, a windmill was mentioned around 1450. 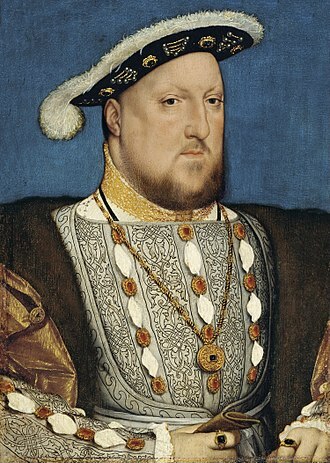 Woolwich remained a relatively small Kentish settlement until the beginning of the 16th century, in 1512 it became home to Woolwich Dockyard, originally known as The Kings Yard, founded by Henry VIII to built his flagship Henry Grace à Dieu. Memorial in Douglas, Isle of Man, to one of RNLI's earliest rescues: rescuing the sailors from the St George in 1830. Standard lifeguard set-up at waters edge. Legal Quays in 1757, by Louis Peter Boitard. This layered beach at Bathurst Inlet, Nunavut is an example of post-glacial rebound after the last Ice Age. Little to no tide helped to form its layer-cake look. Isostatic rebound is still underway here. A model of present-day mass change due to post-glacial rebound and the reloading of the ocean basins with seawater. Blue and purple areas indicate rising due to the removal of the ice sheets. Yellow and red areas indicate falling as mantle material moved away from these areas in order to supply the rising areas, and because of the collapse of the forebulges around the ice sheets.